Let’s start on another painting for my Annual Collector Event and One Person Show, August 31 and September 1st in Santa Fe. To find out more about this FUN event CLICK HERE! 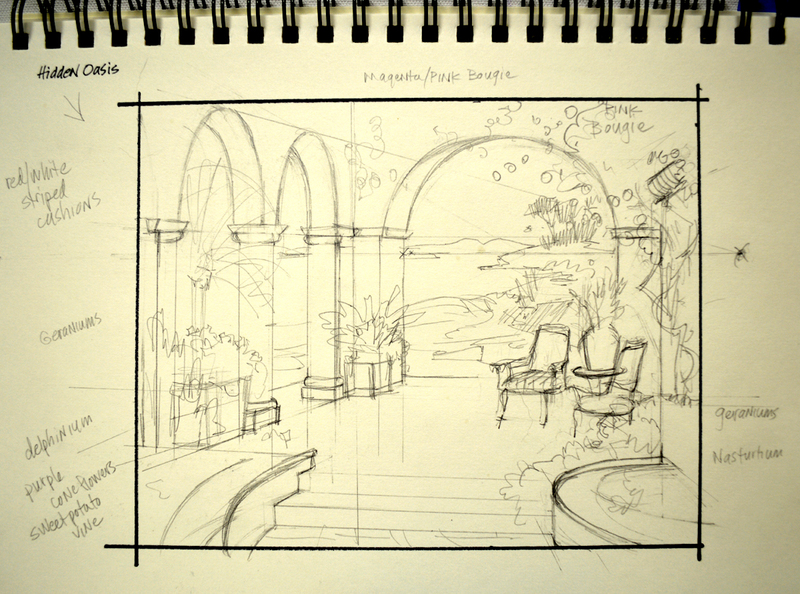 Normally I do a sketch to layout the basic plan or roadmap to follow. 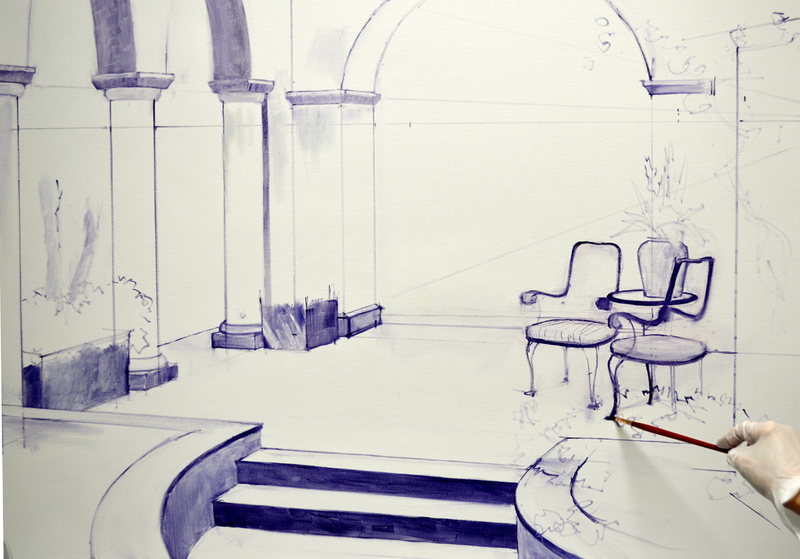 However, I can envision this painting so clearly in my mind I’m going to begin without doing an initial drawing. 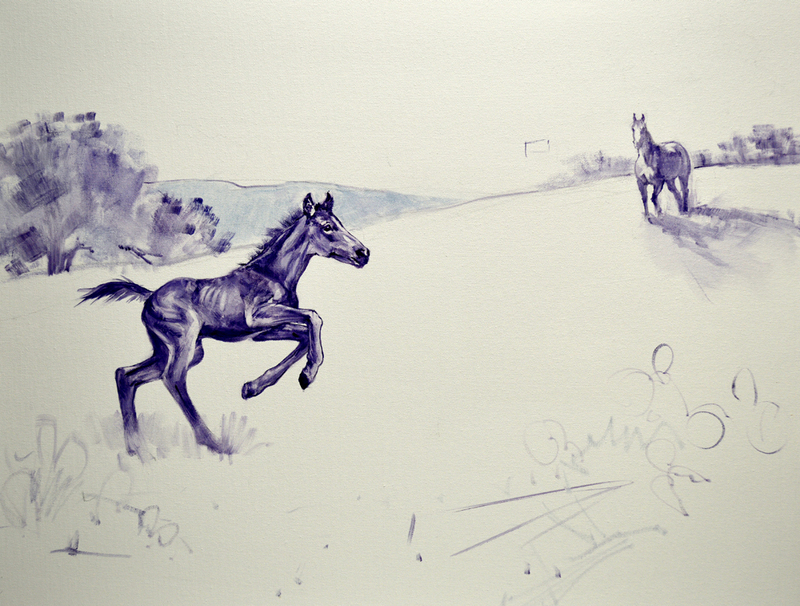 I’ve lightly penciled in the young foal galloping in a field of bluebonnets. After sketching in the large live oak tree and distant mountains, I draw his Mama with a brush dipped in a thin oil wash of MUD (2 parts Ultramarine Blue + 1 part Alizarin Crimson) + Liquin. Please remember as you read through my blog, you may click on this or any of the other images to view them larger. 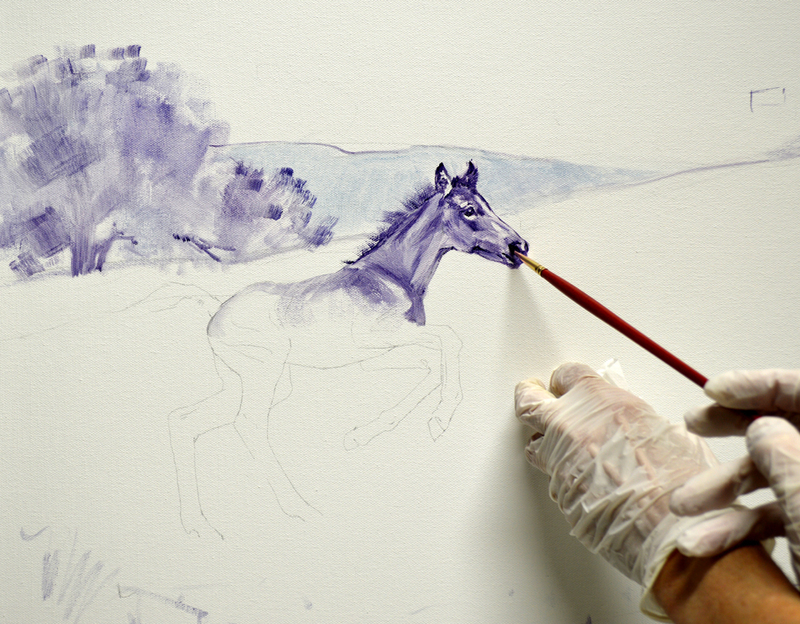 Resting my right hand against my left, which is braced against the canvas, steadies the brush as I delineate the foal’s head. 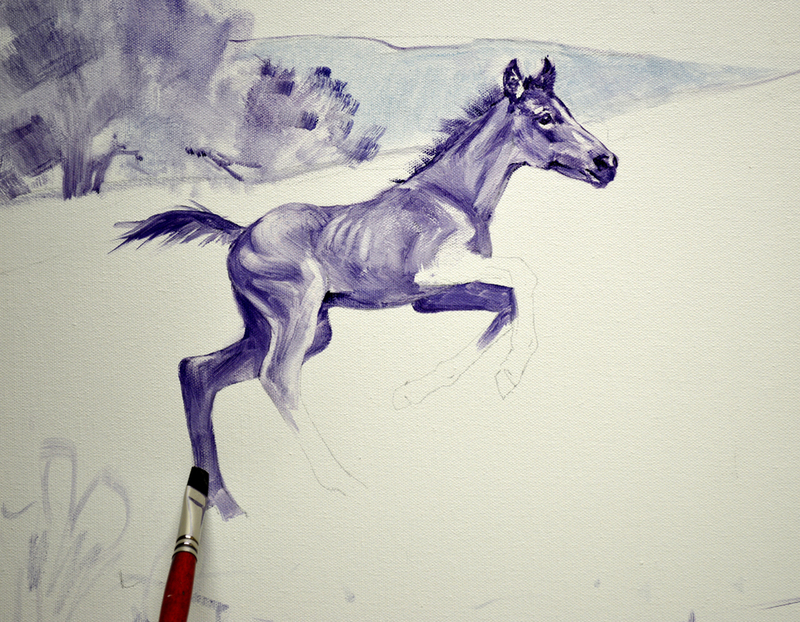 I don’t worry about drawing the hooves on his hind legs, they will be hidden behind grass and bluebonnets. Looking at the horses, I don’t really like the position of the mare. 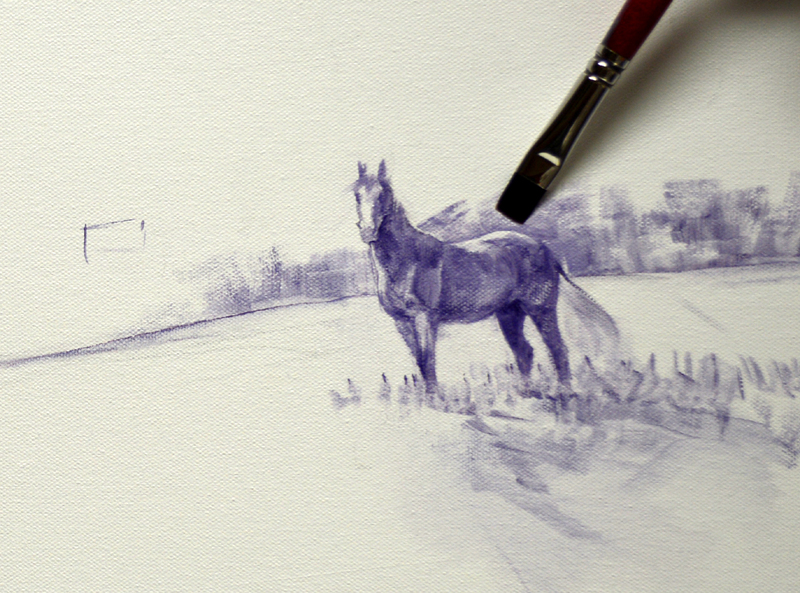 SO……..It’s easy enough to wipe off the oil wash sketch with a clump of tissue dipped in my odorless paint thinner, right now. Once the oil wash is dry that’s another matter all together! I turn Mama a bit so we see more of her body. There will be some trees behind her to accentuate the rim of sunlight on her back and hip. The highlight shows much better with her at this angle. I also lowered the mare’s head just a little, looks more natural. The cactus and rocks in the foreground are just roughly indicated at this point, I’ll sketch them in with more detail later. I appreciate you following my blog. If you would like to receive an email every time I publish a new post please feel free to subscribe to my blog. CLICK THIS LINK and scroll to the upper right side of the page. You will see a heading EMAIL SUBSCRIPTIONS. Just enter your email address and click the button “Sign me up!” It’s easy. Jack’s Place with a Chinese Twist! 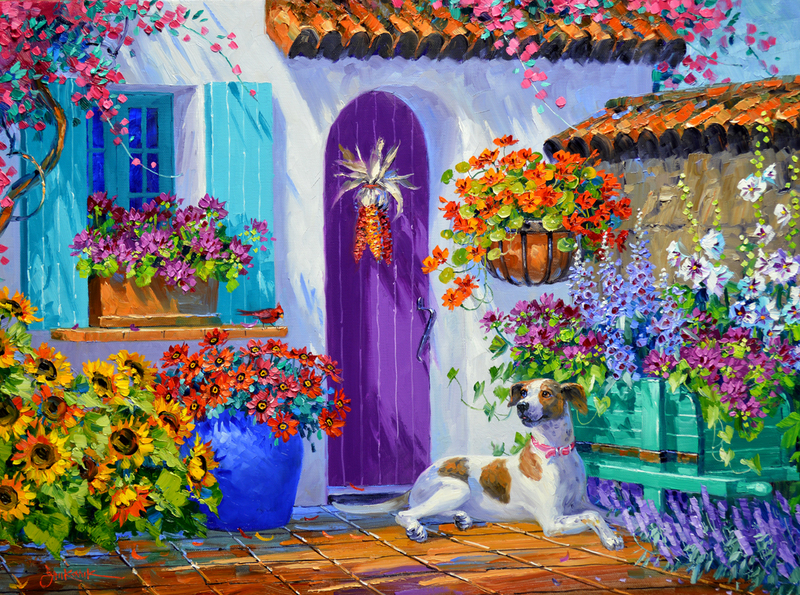 This is a fun Anniversary gift based on my original oil painting, “Jack’s Place”, shown above. 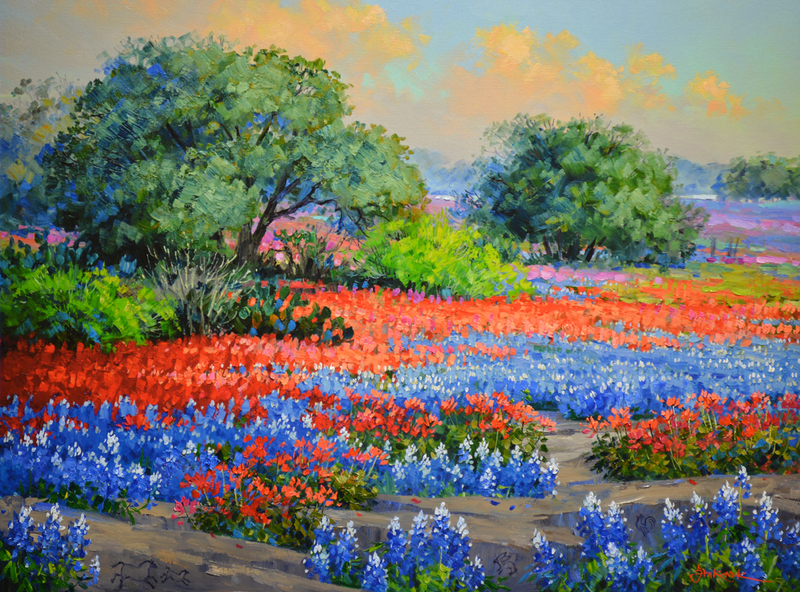 Spring in the Lone Star State is delightful; God paints the Texas Hill Country in a cornucopia of beautiful colors. 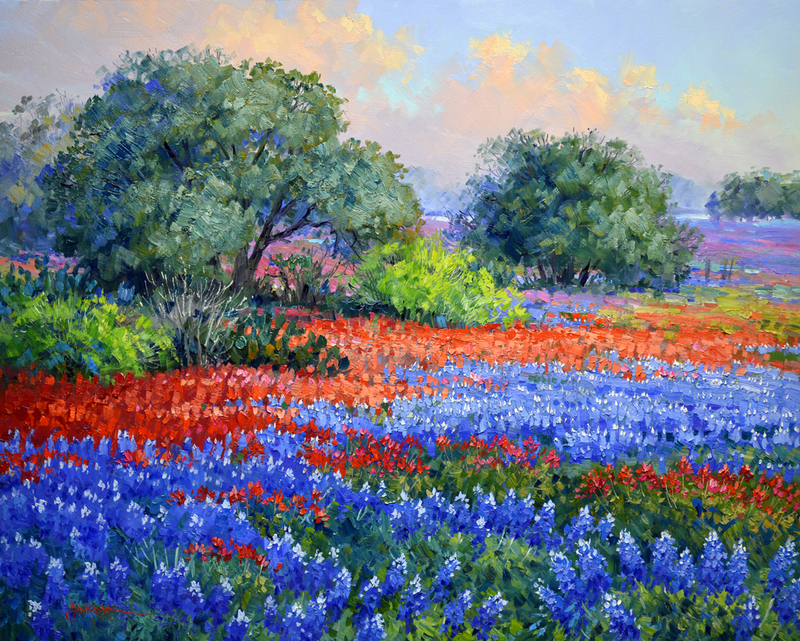 Because the show varies from year to year we Texans tend to record time by the best wildflower displays. 2010 was SPECTACULAR! Jack and I lived in Floresville that spring; each afternoon we would clean our brushes early and hop in the car, armed with cameras. We’d drive the tiny back roads, exclaiming with joy at the beauty of Our Lord’s tapestry covering the rolling hills. One day we came around a corner and screeched to a halt, frozen in awe. The scene before us was breathtaking. Neither of us could speak, Jack reached across the center console and gently took my hand. We sat speechless for minutes, overcome by God’s masterful combination of complimentary hues. Birds sang in the trees; the breeze gently swayed the brilliant blossoms. When our jaws finally unlocked we conversed in whispers; afraid we’d disrupt the spell if we spoke too loudly. We instantly agreed, this was the BEST of the Best wildflowers we’d ever experienced. After God took Jack home to Heaven I painted “Jack’s Place” to honor him and this moment we shared. 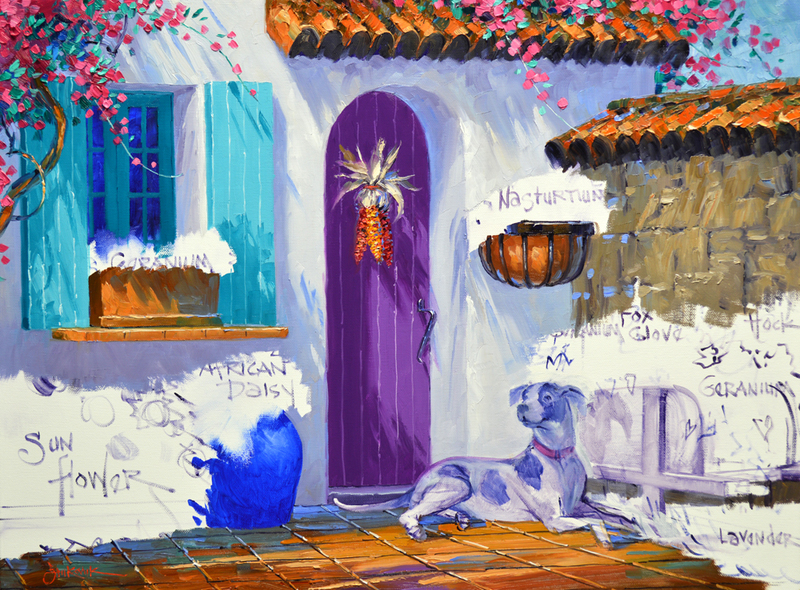 Jack taught me to paint and then set his stellar career aside to promote mine. This piece is my tribute to Jack White; my dearest friend, mentor and the love of my life. 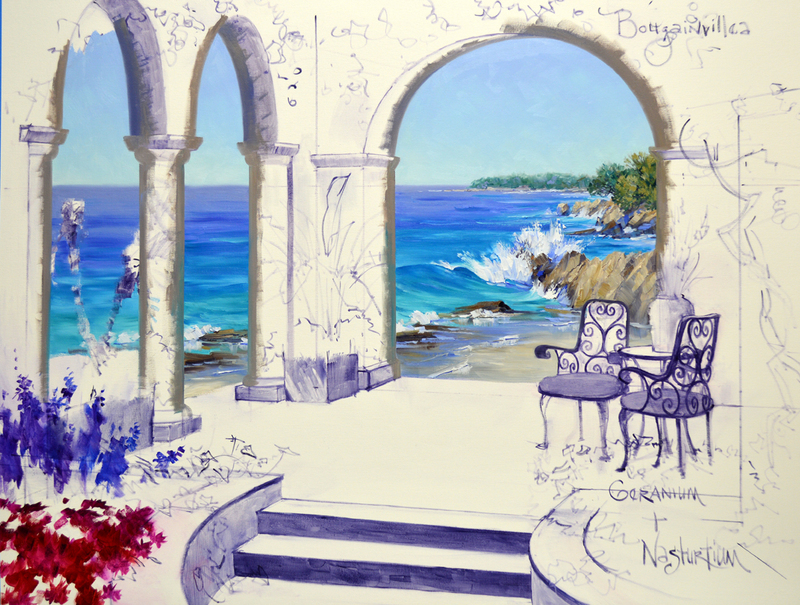 The original painting was auctioned on eBay, the entire proceeds were used to start an endowed scholarship for Fine Art Students, the JACK WHITE CHARACTER SCHOLARSHIP, to honor Jack’s memory for years to come at his Alma Mater, Howard Payne University. CLICK HERE if you would like to make a tax deductible donation to the fund. AND…to find out about the very first recipient of our JACK WHITE CHARACTER SCHOLARSHIP CLICK HERE. 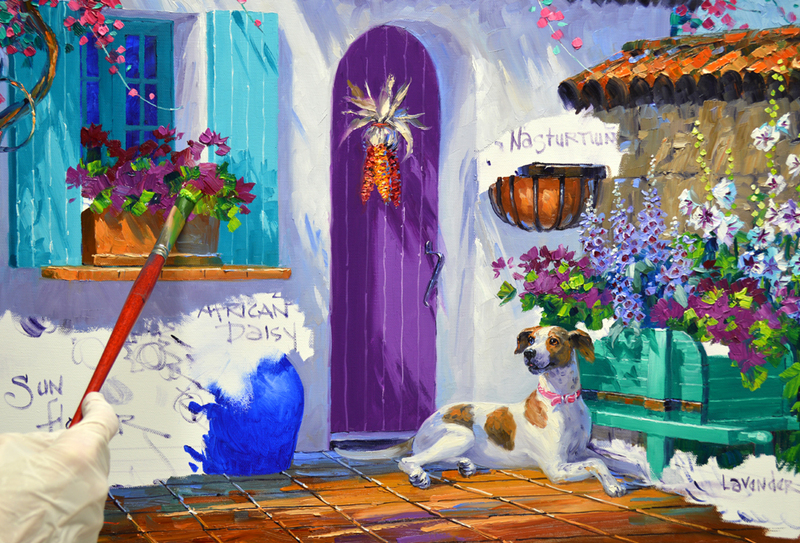 My collector asked me to do one of our Limited Originals, a hand embellished giclee on canvas of “Jack’s Place”, to give to his wife for their 25th Anniversary. But wait, there is more to the story. 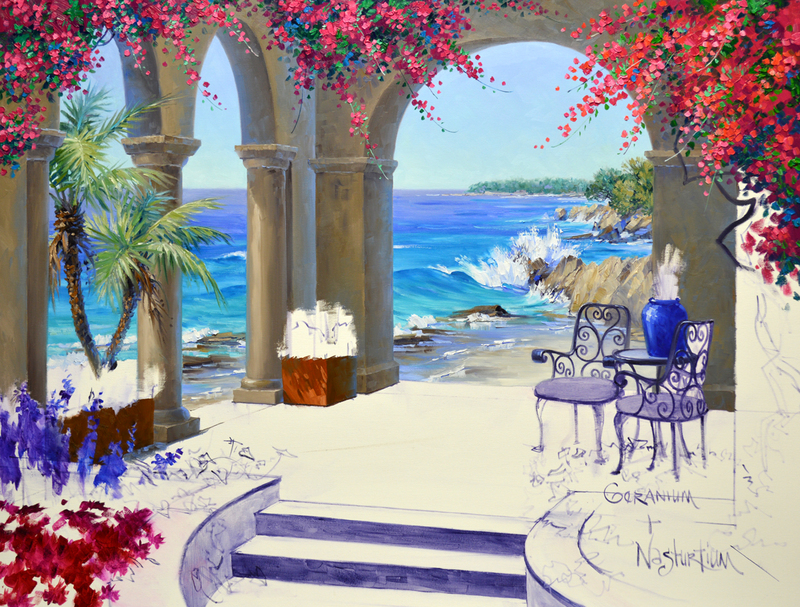 Ted and Jennifer bought their first Senkarik Painting in Carmel, California on their Honeymoon! Is that cool or what? 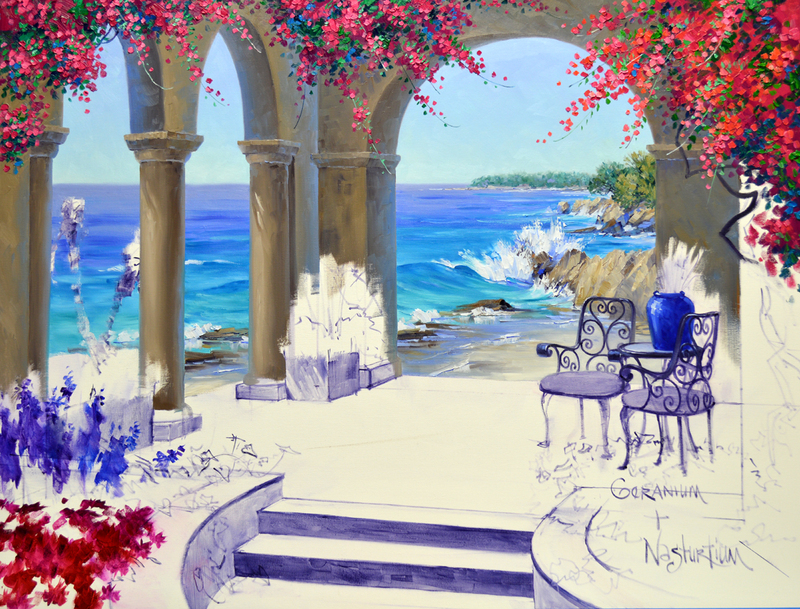 Ted and Jennifer have added several of my paintings to their collection over the years. In one way or another we’ve worked in the Chinese Zodiac symbols for them and their two boys, Max and Alex. Ted wanted to follow the tradition on this piece. So after much thought I decided to add some Texas Limestone cropping up in the field of Bluebonnets. Then do the designs like petroglyphs on the rocks. 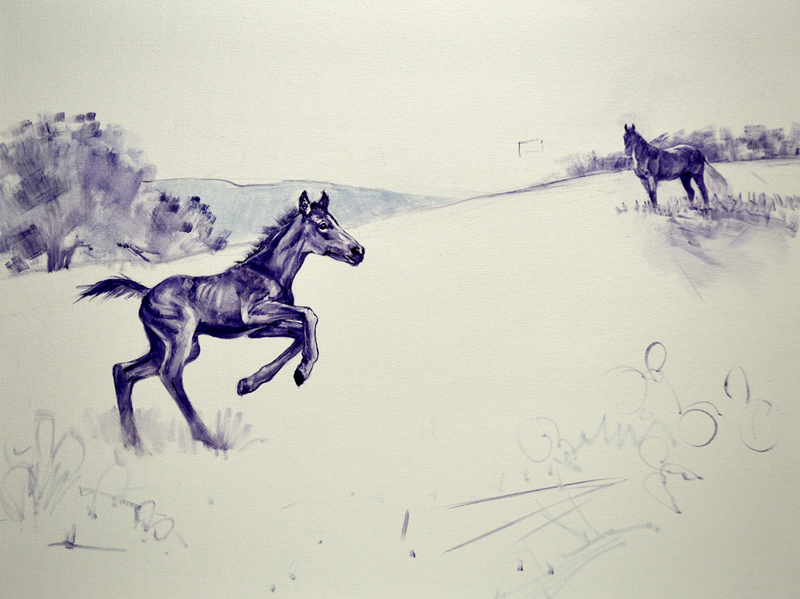 Both Jennifer and Alex were born in the year of the horse, so a mare and foal gallop along in the lower left corner. You may click on the image to view an enlargement. A rabbit for Max and rooster for Ted are carved into the rocks in the lower right of the piece. Bluebonnets and Indian Paintbrush nestle around the huge slags of limestone. The old weathered wheelbarrow is painted with combinations of Severs Green + White. 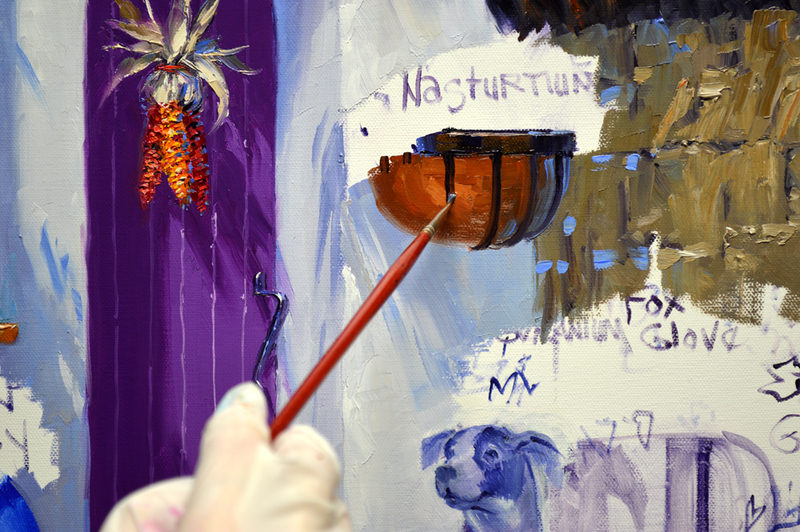 A little bit of MUD (2 parts Ultramarine Blue + 1 Part Alizarin Crimson) is added in the mix for the darker shadows. Notice I’ve pulled a few strokes of the same color into the floor beneath the wheelbarrow, giving the impression of a reflection in the damp tile surface. 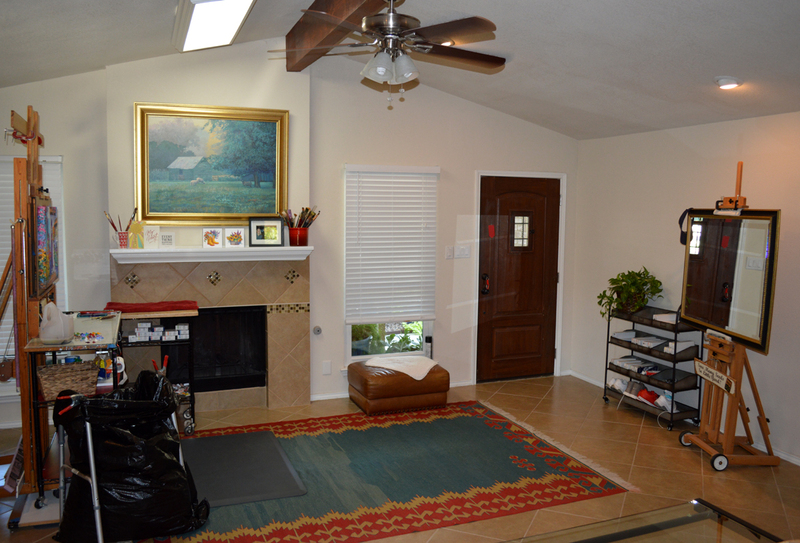 Phoebe’s body is blocked in with color from the White stucco walls. 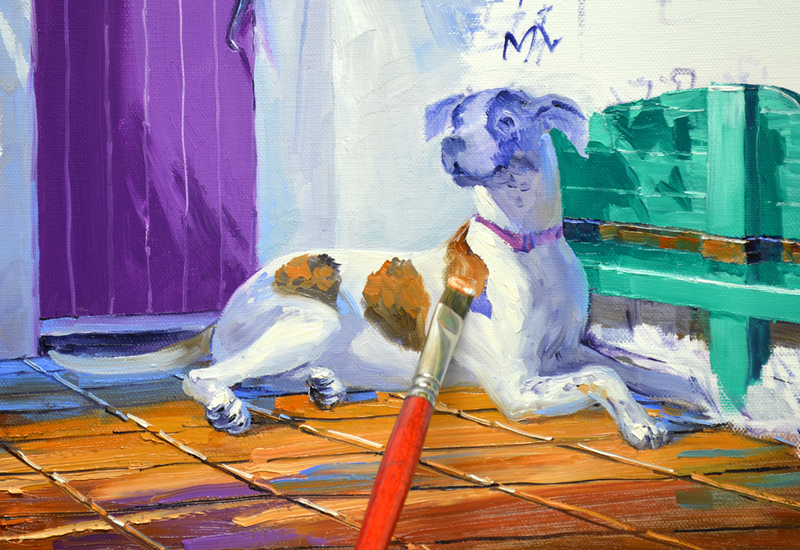 The highlights on the white portion of her coat are made with White + a tiny touch of Cadmium Orange. This makes a warm, bright white that comes forward of the wall in back of her. Her spots are made of paint leftover from the floor and rock wall. 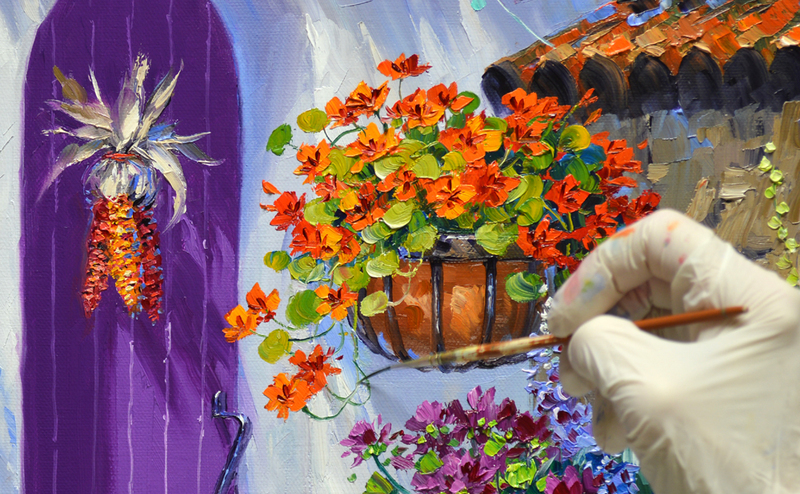 Hollyhocks extend over the edge and onto the side of the gallery wrap canvas. 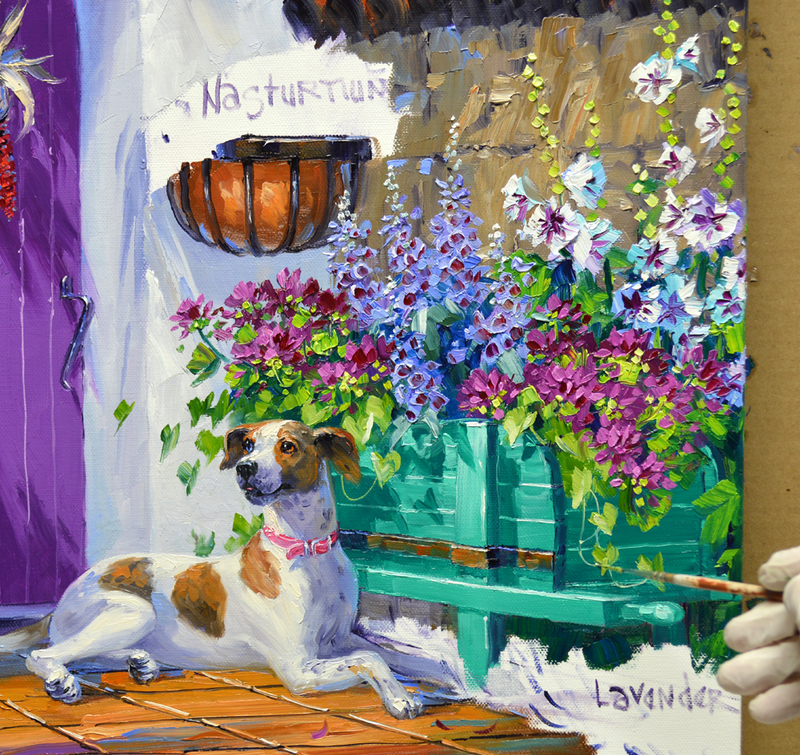 The flowers are blocked in with mixes of White + Dioxazine Purple, White + Phtalo Blue and White + Ultramarine Blue. The deep impressions in the center of the blossoms are indicated with Magenta + Liquin. Periwinkle Foxgloves nestle beside the Hollyhocks. 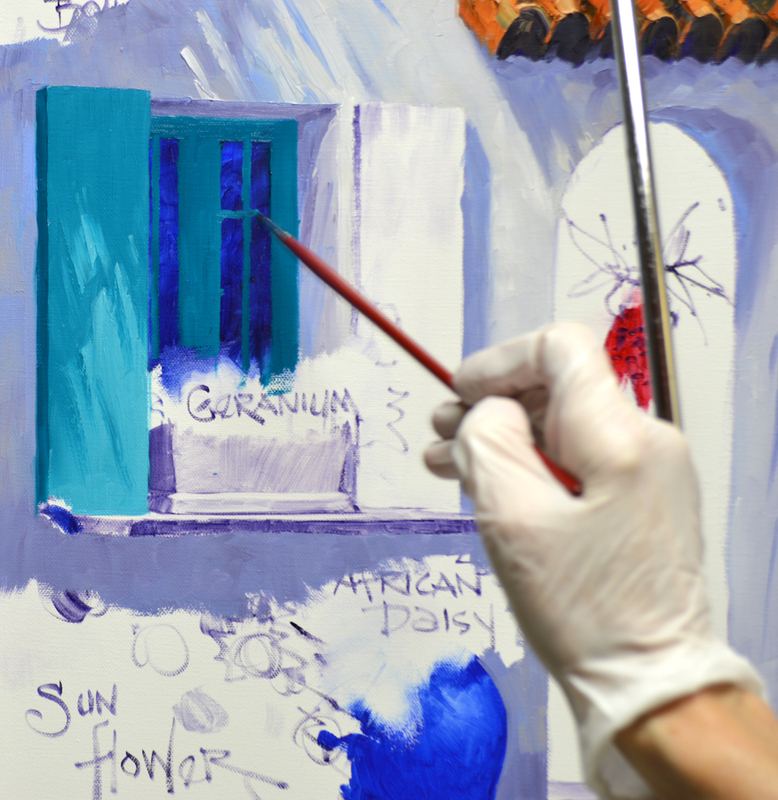 They are painted with various combinations of Dioxazine Purple + Ultramarine Blue + White and Ultramarine Blue + White. The tall seeded stems extending above the flowers are made with White + a bit of Pthalo Blue + a tiny amount of Cadmium Orange. Red Purple Geraniums fill out the wheelbarrow and the container on the window sill. 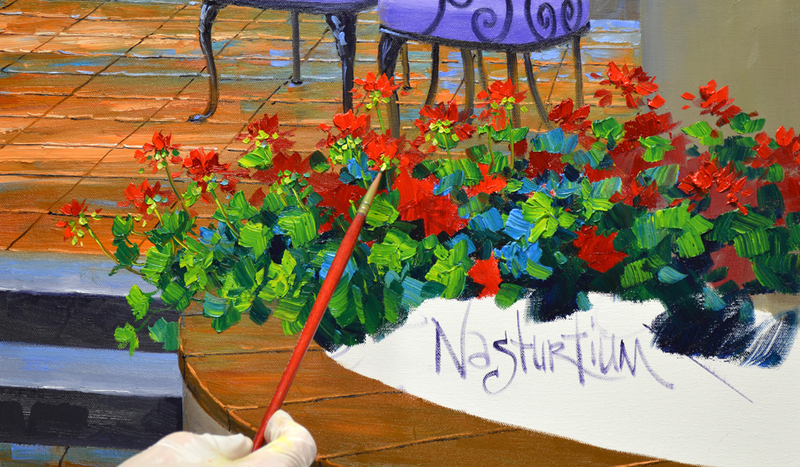 Mixes of Magenta + White and Magenta + Alizarin Crimson + White are used for the flowers. The leaves are various shades of Pthalo Blue + Lemon Yellow. Our wheelbarrow is getting pretty full but there is still some room for Sweet Potato Vine. The long tendrils lined with heart-shaped leaves, add a touch of love to the painting. Nasturtiums drape out of the wall container by the door. 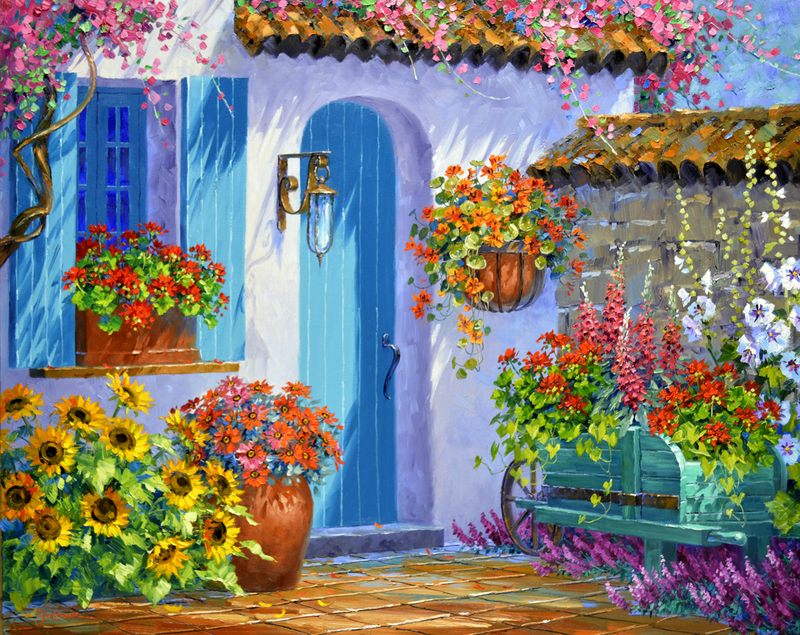 The brilliant orange flowers and variegated Maize (corn) are a beautiful combination with the Plum colored door. Purple, Orange and Green, are all secondary colors while Red, Blue and Yellow are the primary hues on the color wheel. 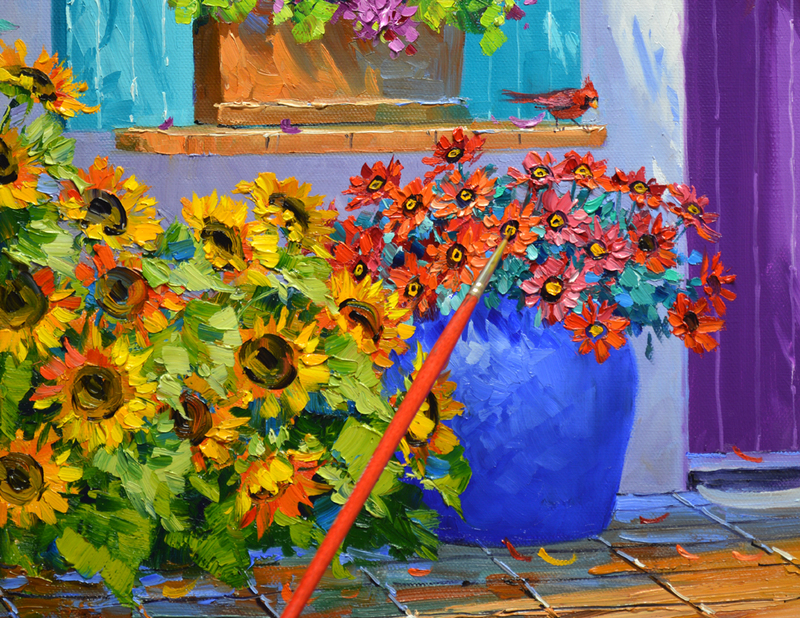 Sunflowers and African Daises snuggle below the window sill. Mr. Chippers decided to drop in as an added surprise for Jeana. She loves Red Cardinals! Let’s turn our attention to the courtyard floor. The surface is covered with Terra Cotta mixtures made of MUD (2 parts Ultramarine Blue + 1 part Alizarin Crimson) + Cadmium Orange + White. 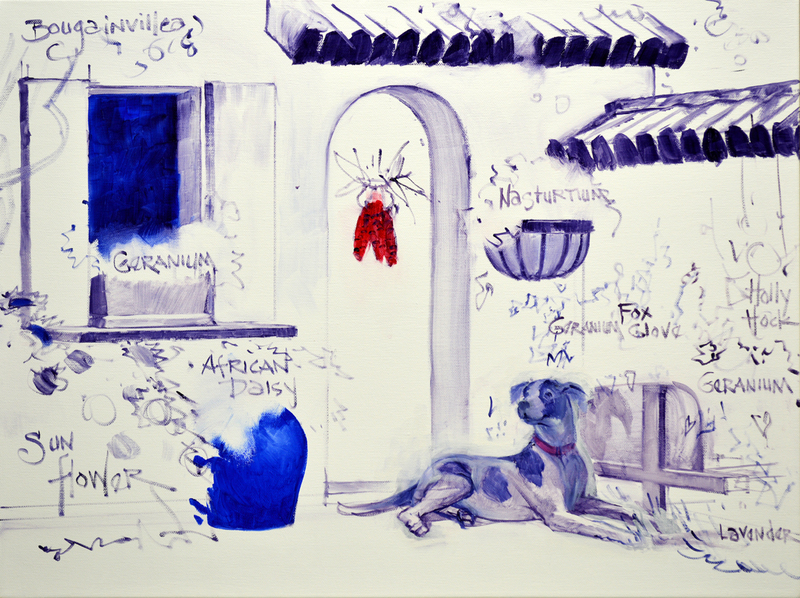 A few strokes of Ultramarine Blue + White are made along the back; the coolness of the blue makes it recede. After the light and shadows are established I come back with a thin brush dipped in a combination of MUD + Liquin and pull the perspective lines into the wet paint. Next, the horizontal lines are drawn and edges of the tiles highlighted. The wall planter is made with some of the paint remaining from the floor. Then the mix of MUD + Liquin is used to form the wrought iron holder. 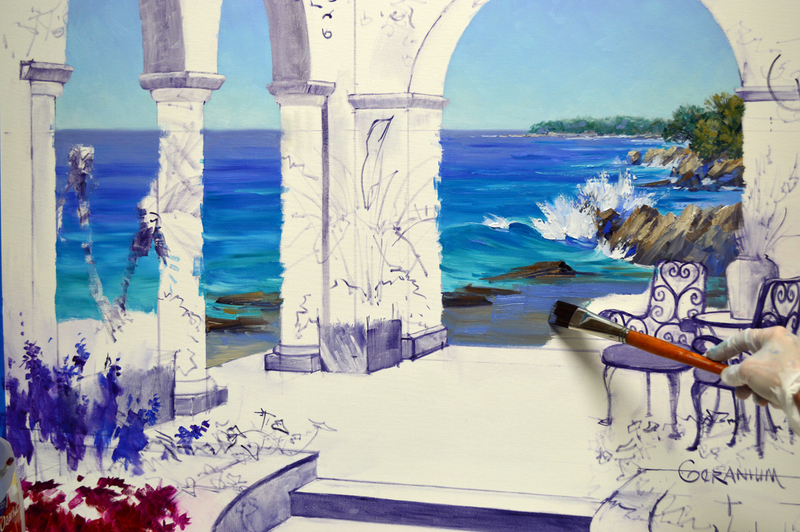 After blocking in the distant trees with soft blue greens made of Pthalo Blue + Cadmium Orange + White the stucco walls are “constructed”. 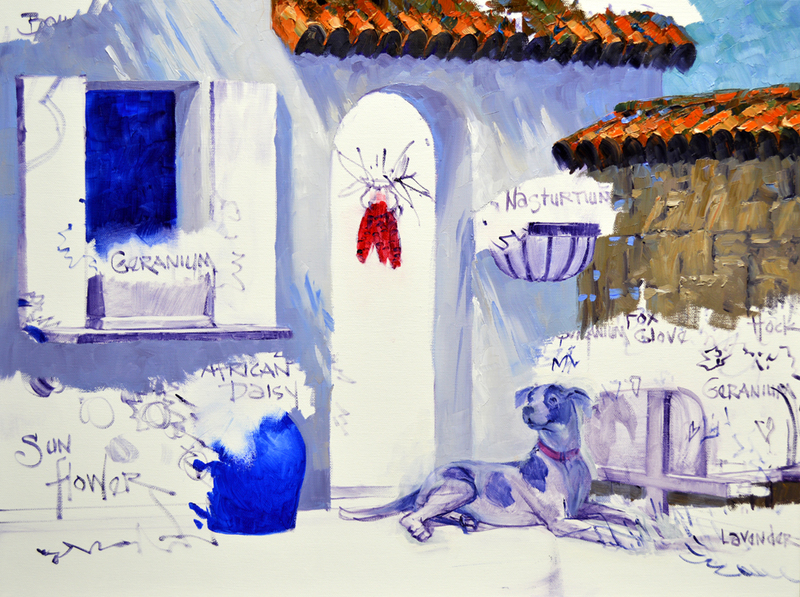 Mixes of MUD (2 parts Ultramarine Blue + 1 part Alizarin Crimson) + White and Ultramarine Blue + MUD + a tiny touch of Cadmium Orange + White are used for the shadows. The areas of the building illuminated by the brilliant sunlight, are painted with mixtures of White + Ultramarine Blue + a bit of Cadmium Orange and White + MUD. I don’t use pure White at this point, that is reserved for highlights. The surface of the rock wall is first covered with several shades of MUD + Cadmium Orange + a touch of Phtalo Blue + White. A brush dipped in a mix of MUD + Liquin is used to indicate the crevasses between the individual stones. 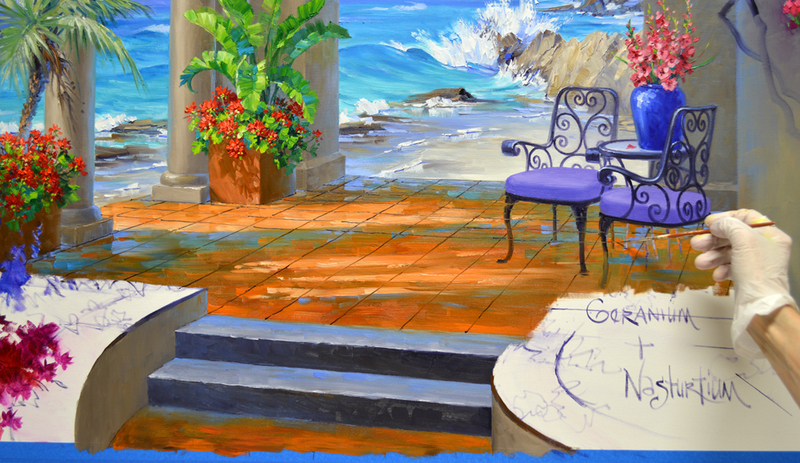 This is done impressionistically; I don’t want to outline each and every rock. AHHH! Construction of the building and courtyard wall is done. Now, let’s add the window and shutters! Jeana requested Turquoise so I pulled out my trusty tube of REMBRANDT Pthalo Turquoise Blue. Mixed with White it makes a beautiful soft coler that is just perfect. On the right in the picture above, the colorful bracts of the Bouganvillea have been blocked in with combinations of Permanent Rose + Magenta + White and Permanent Rose + White. On the left I’m painting the foliage around the clumps of pink using several shades of Viridian Green + White and Pthalo Blue + White. Beginning again! On a new puppy portrait! 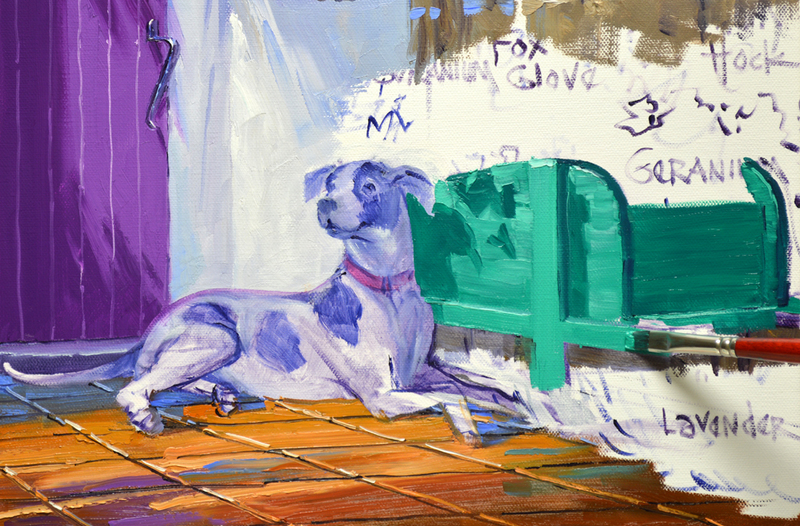 Not that Phoebe is a puppy, but it sounds a bit more peppy than saying a dog portrait! 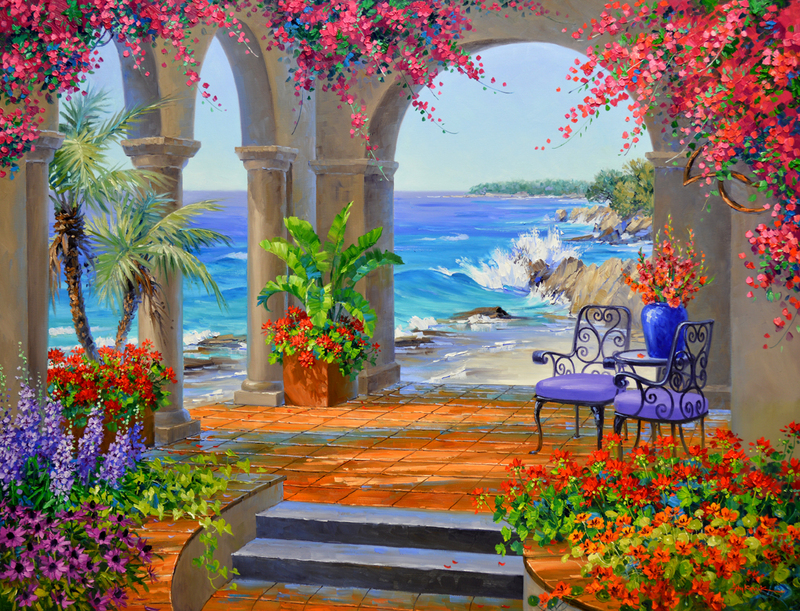 Our setting is based on “Serene Welcome”, a painting done earlier this year. Please remember as you read through my blog, you may click on any of the images to enlarge them. Here’s Jeana’s sweet fur baby, Phoebe! 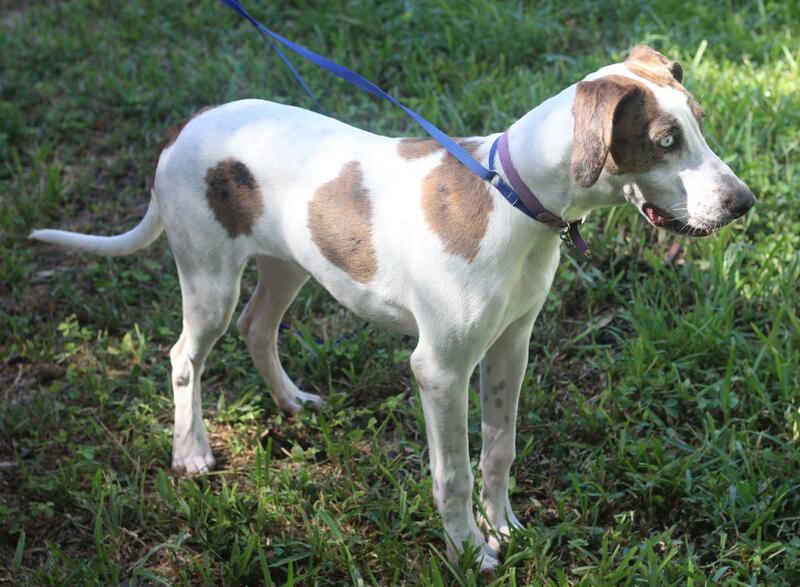 She’s 2 1/2 years old and a mix of Great Dane, Greyhound and Catahoula. Those of you who are regular followers of my blog may remember Jeana. This is the 19th painting I’ve done for her! Knew we’d collaborated on several but couldn’t believe it when I went back and counted. She is a wonderful collector, has cool ideas and is very generous. Some of those paintings have been gifts for her family and friends. 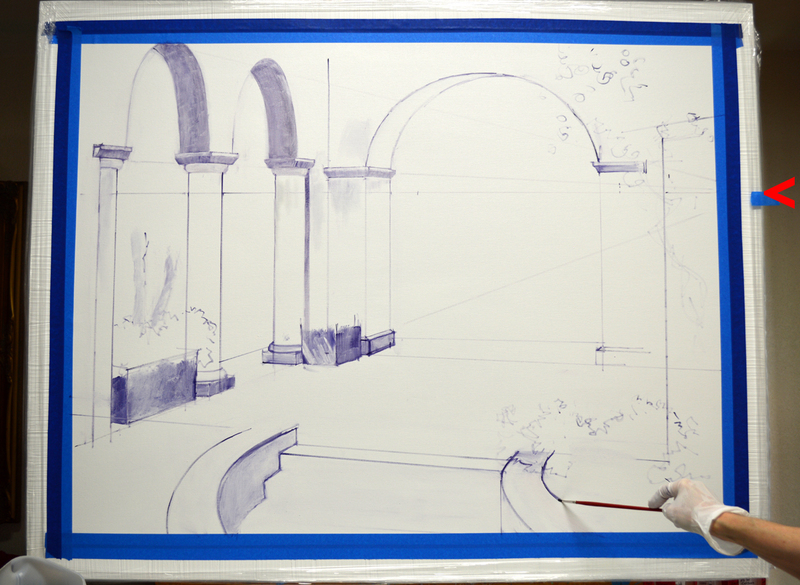 I start sketching the basic plan up on the canvas with a brush dipped in a thin oil wash made of MUD (2 parts Ultramarine Blue + 1 part Alizarin Crimson) + Liquin. 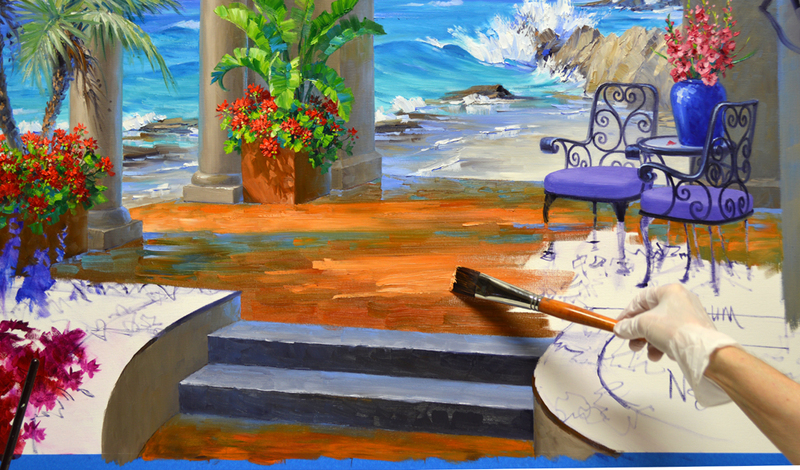 All of the upright lines are drawn with the aid of a T-square balanced on the top edge of the gallery wrap canvas. 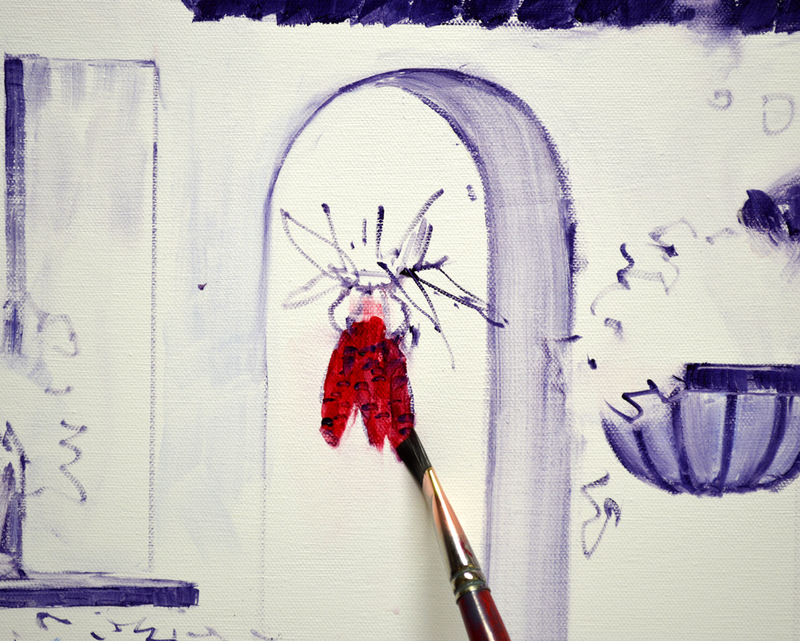 The cluster of Maize, adorning the door, is washed in with a mix of Alizarin Crimson + Liquin. A few darker kernels are added with some of the MUD mixture. I begin establishing Phoebe’s general shape with the thin oil wash made of MUD + Liquin. After looking at the sketched up plan on canvas in the mirror placed behind me in the studio, I realized I had Phoebe too large and bulky. Here’s a picture of my easel set up so you can see the mirror. 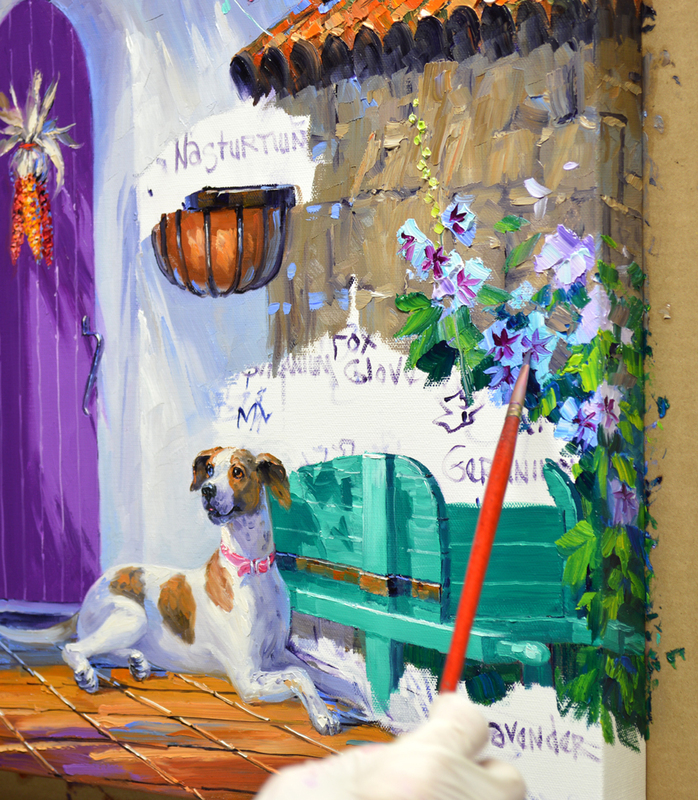 It’s on a easel with wheels that can be rolled closer to my painting easel if needed. 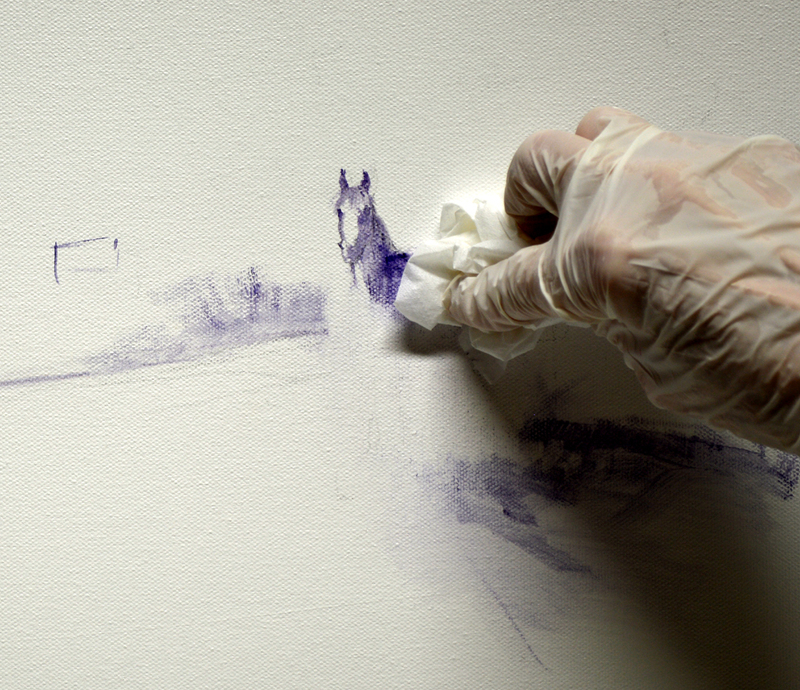 The background drawing was dry so it was very simple to “erase” the ghosted form by wiping the wash off of the canvas with some tissue. She’s redrawn and now Phoebe is the correct size! 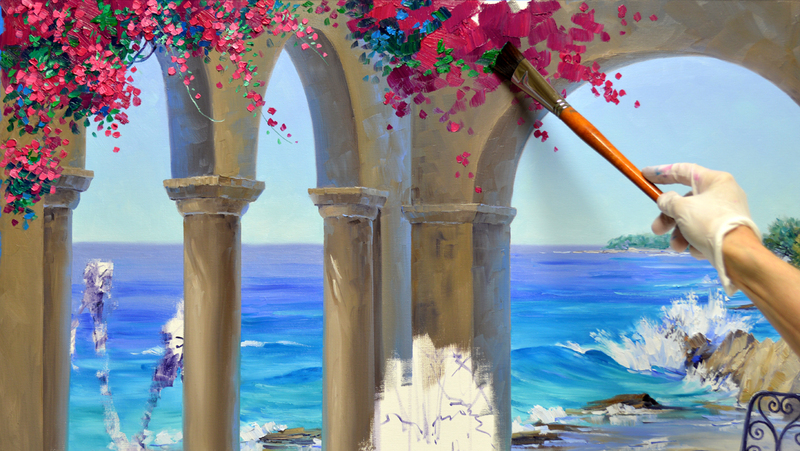 We’ll begin painting in our next session, hope you’ll come watch. If you would like to receive an email every time I publish a new post please feel free to subscribe to my blog. CLICK THIS LINK and scroll to the upper right side of the page. You will see a heading EMAIL SUBSCRIPTIONS. Just enter your email address and click the button “Sign me up!” It’s easy. Large leaves of a Giant Bird of Paradise sway gracefully over Geraniums made of Cadmium Red Deep + Alizarin Crimson, Cadmium Red Deep and Cadmium Red Light. 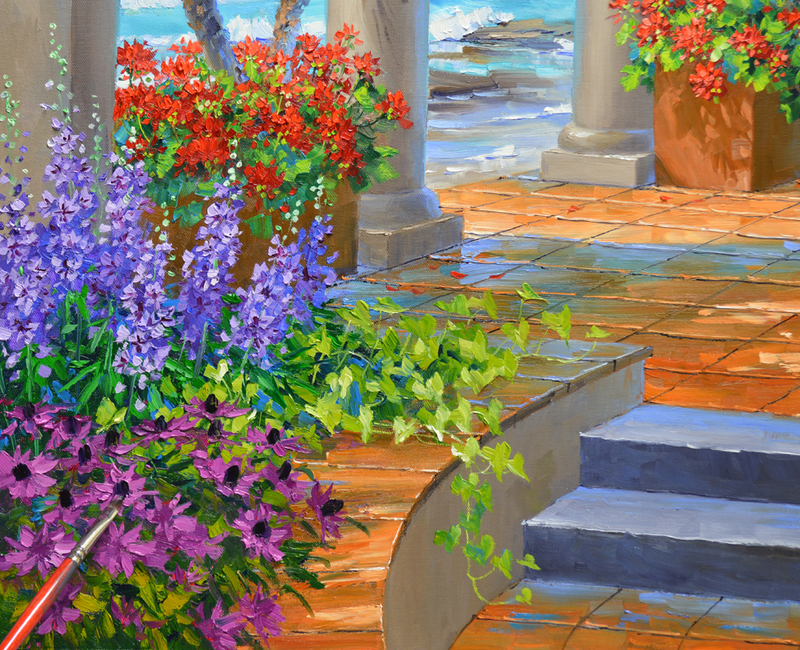 The bright green foliage of the Geraniums is combinations of Pthalo Blue + Lemon Yellow and Pthalo Blue + White. The flowers are blocked in first, you can see that step in the container on the left with the palm trees. The greens are painted around the masses of red, helping to shape the blossoms as seen on the right. You may enlarge any of these images, just click on the picture. I’ve filled the blue ceramic container on the bistro table with fresh Gladiolas and now it’s time to begin tiling the floor of the terrace. The entire surface is covered, establishing the light streaming under the arches and the long shadows. 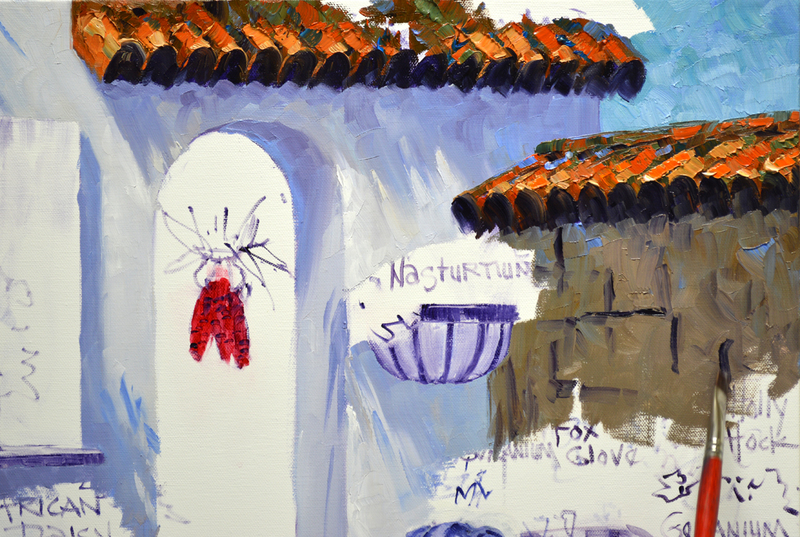 The perspective and horizontal lines separating the individual tiles are drawn into the wet paint with a fine liner brush dipped in a thin mix of MUD (Ultramarine Blue + Alizarin Crimson) + Liquin. The Geraniums in the foreground planter are the same mixes we used for those in the distant containers on the terrace. These blossoms are highlighted with a combination of Cadmium Red Light + a touch of Cadmium Orange which makes them a bit warmer so they come forward. Coneflowers nestle at the base of the tall Delphiniums. Mixes of Magenta + Dioxazine Purple + White and Magenta + White are used for the striking blooms. Dark, cone shaped centers are added with MUD + Liquin. Nasturtiums scramble along in front of the Geraniums in the curved planter. 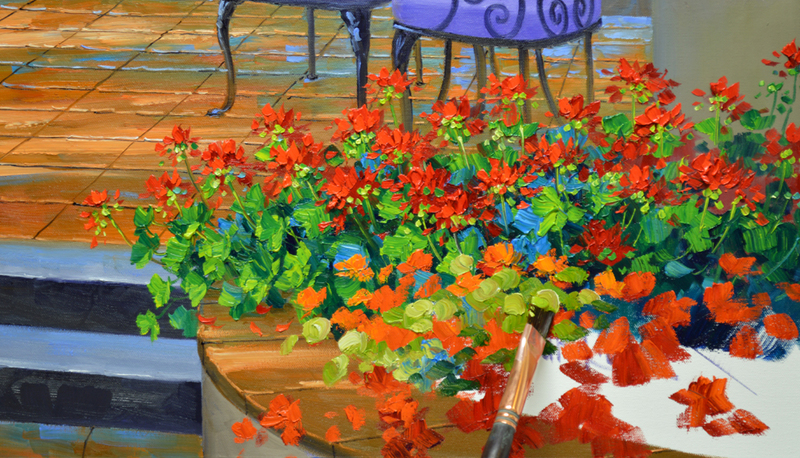 The fragrant flowers are mixes of Cadmium Red Light + Cadmium Orange, Cadmium Orange + Alizarin Crimson and Cadmium Orange. The round leaves, made of mixtures of Pthalo Blue + Cadmium Yellow Medium, are formed by twisting my Bright, square tipped brush. 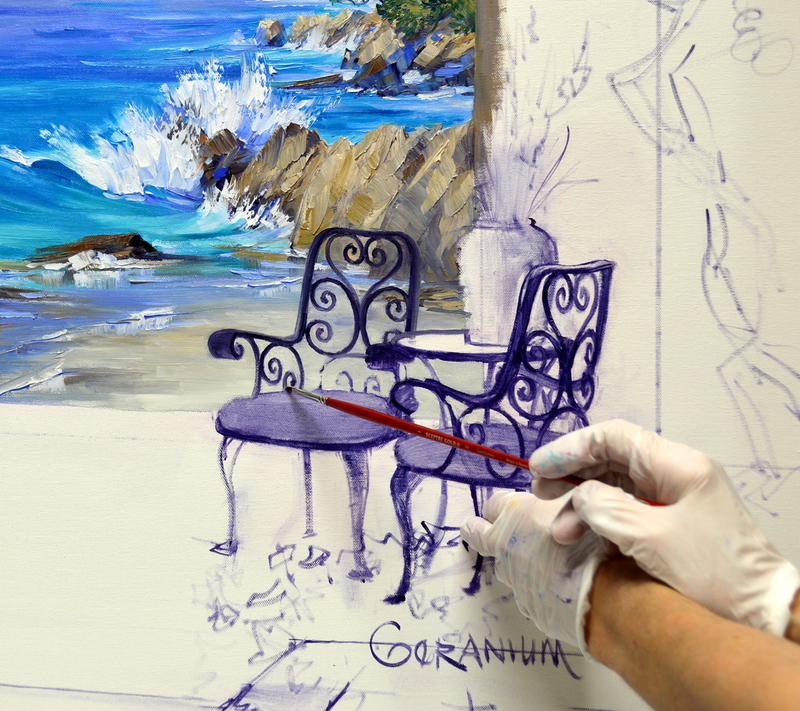 While the paint of the beach behind the chairs is still wet I draw the scroll work on the wrought iron chairs. 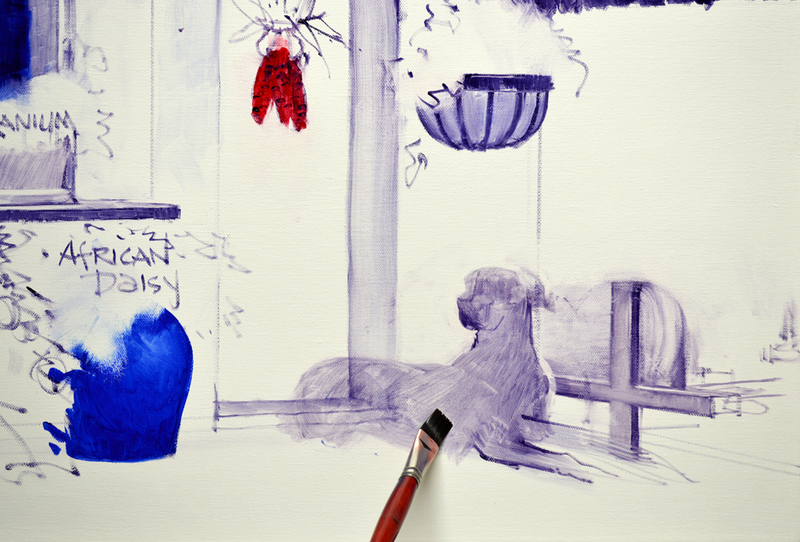 The brush, dipped in a thin mix of MUD (Ultramarine Blue + Alizarin Crimson) + Liquin pulls easily through the background. 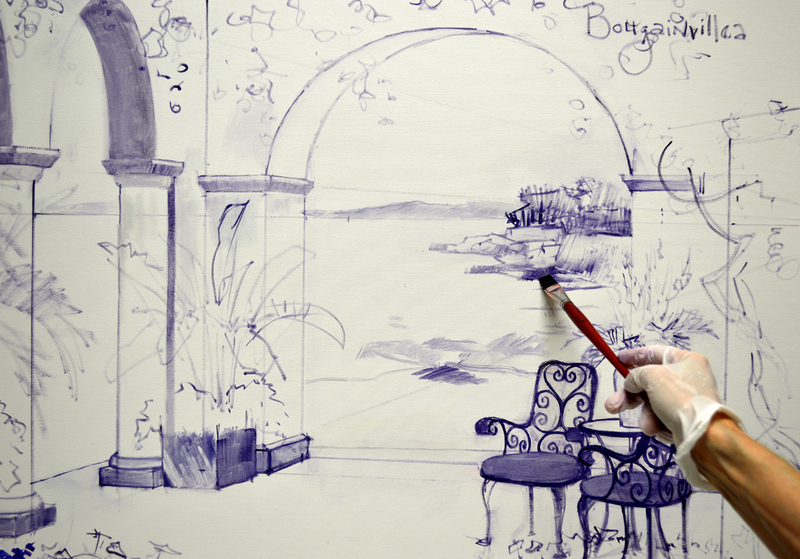 My left hand is braced against the canvas, giving my right a steady support as I delineate the intricate pattern. You may click on this, or any of the other images, to see them larger. The building is blocked in with mixes of MUD + Cadmium Orange + a tiny touch of Pthalo Blue + White. The long highlight, running the length of the column where the sun illuminates it, is pulled straight down with the same combination plus more White. 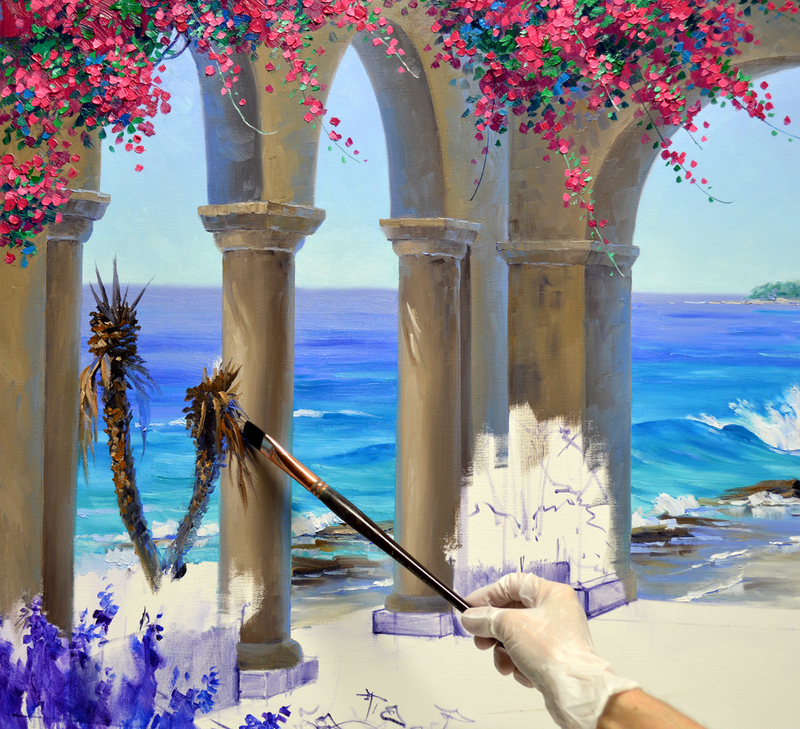 The Bougainvillea streaming over the arches is made of mixtures of Permanent Rose + Magenta + White and Permanent Rose + White. These make a cool pink that will recede. The leaves are Viridian Green + a bit of Cadmium Yellow Medium. 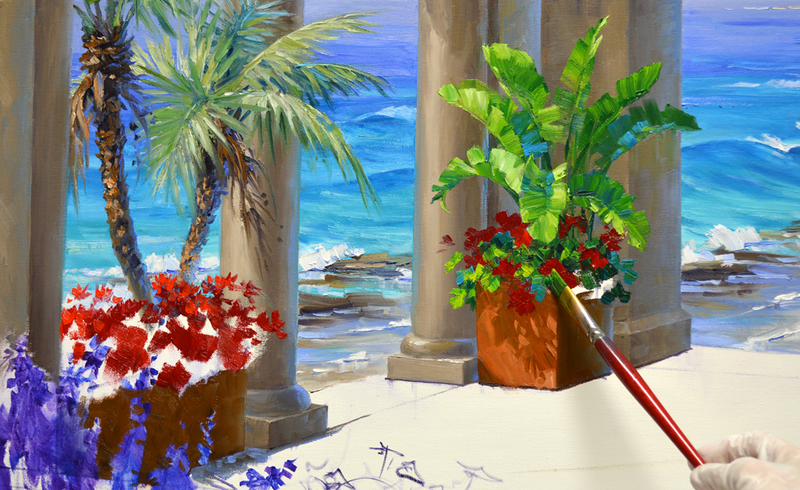 A few leaves of Pthalo Blue + White are added here and there for additional coolness in the foliage. 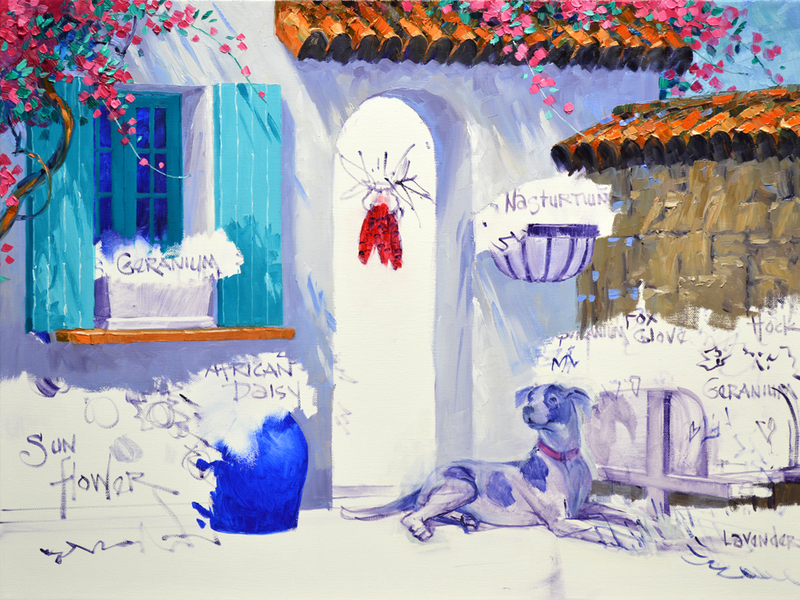 You can see how the warmth of the mixes of Permanent Rose + Cadmium Red Light + White make the Bougainvillea on the right side appear to be closer to the foreground. 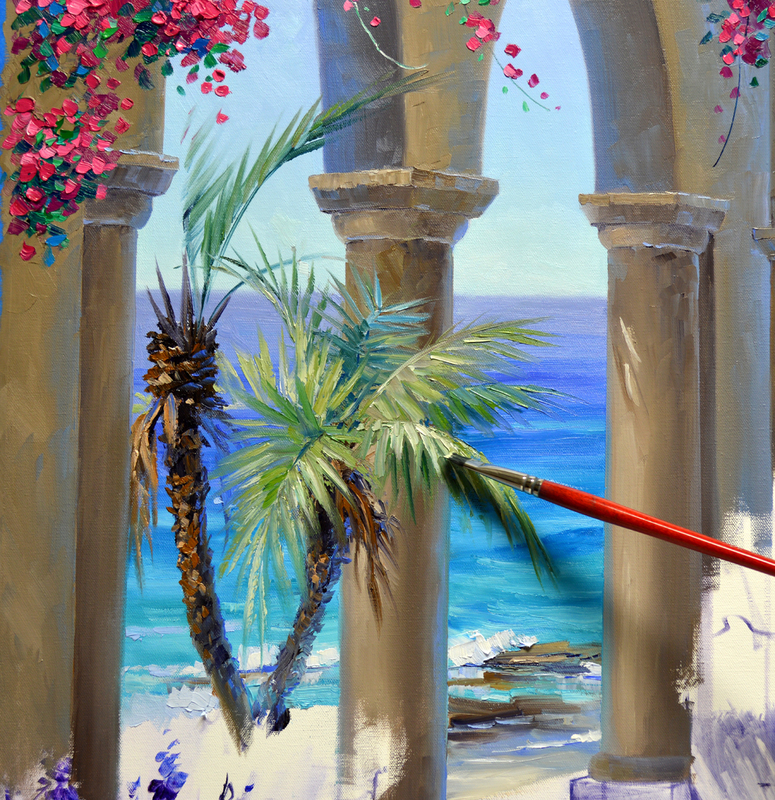 Trunks of the palm trees are painted over the wet ocean and column behind them. 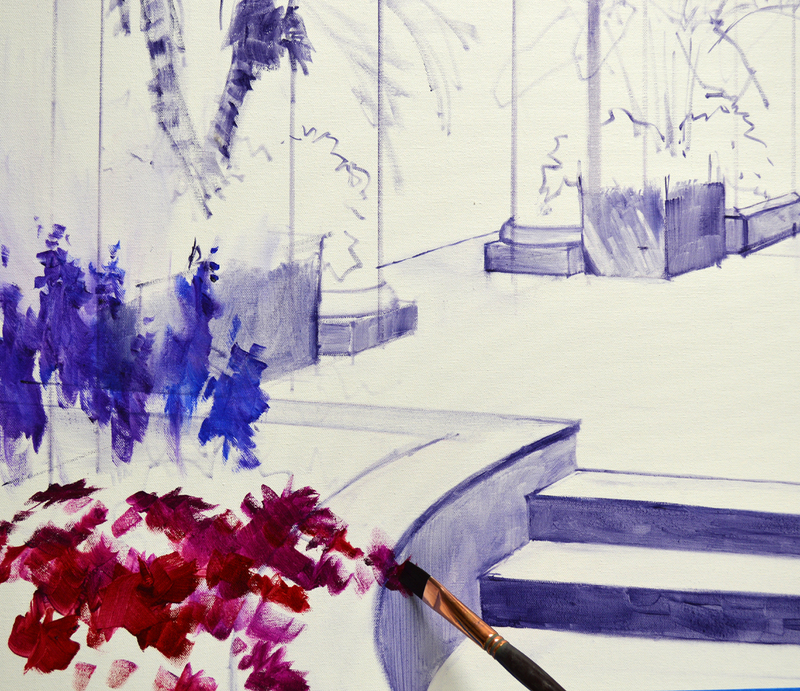 The long leaves or fronds of the Palms are mixes in various combinations of Pthalo Blue + Cadmium Orange + Cadmium Yellow Medium + White. The sand, washed by the surf rushing in and out, gleams with blue reflections from the sky high above. Please remember, you may click on any of the images to view them larger. 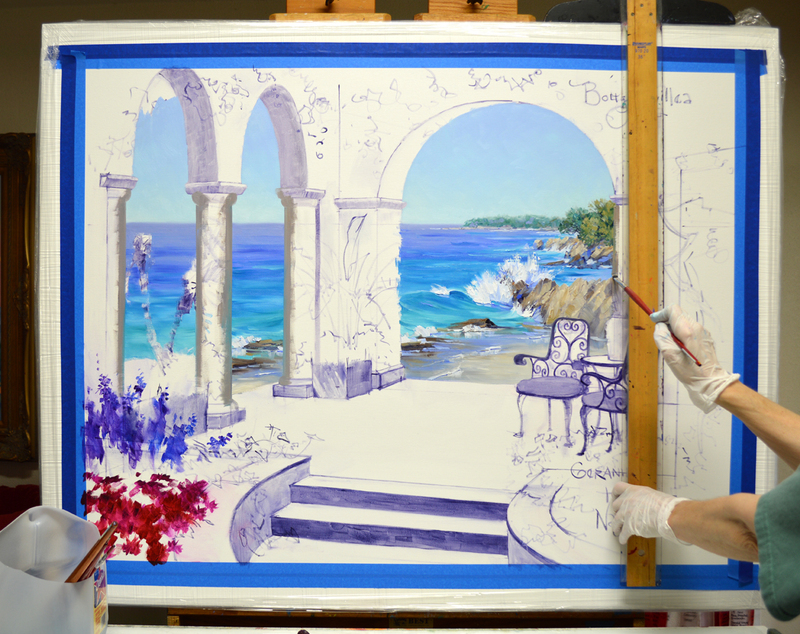 My last step in today’s session is to pull the edges of the arches and columns into the wet paint of the background. 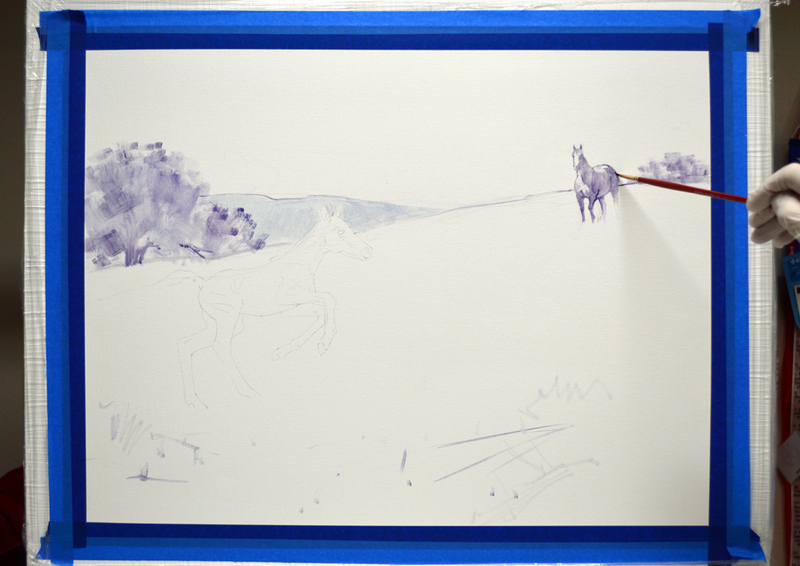 A T-square is placed on the top of the canvas; using it as a guide for my brush enables me to make the lines straight. 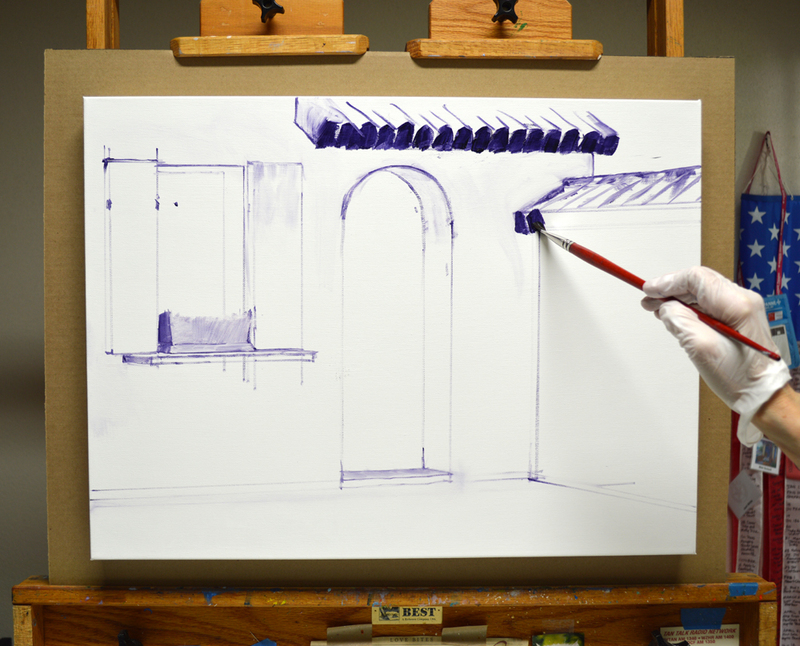 It’s much easier to make the lines smooth while the paint behind them is still pliable. This would be very difficult to do if the background was dry, the edges would be bumpy and uneven. 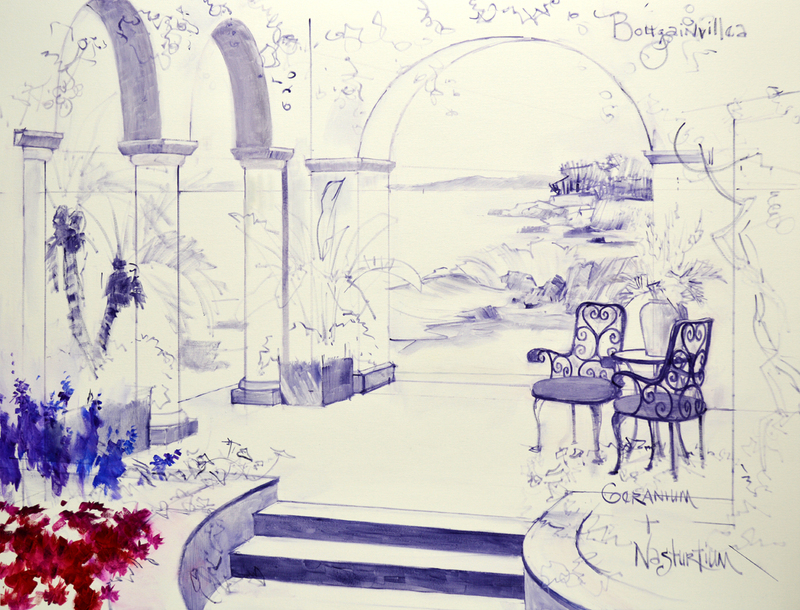 We’re headed to a secluded terrace on the Cote d’Azur today. My sketch is shown above. Since this painting is not a commission my drawing is just done in pencil and not nearly as finished as it would be for a collector to see. Notes are jotted along the margin as a guide. Notice the “star” to the right side of the sketch on the horizon line. 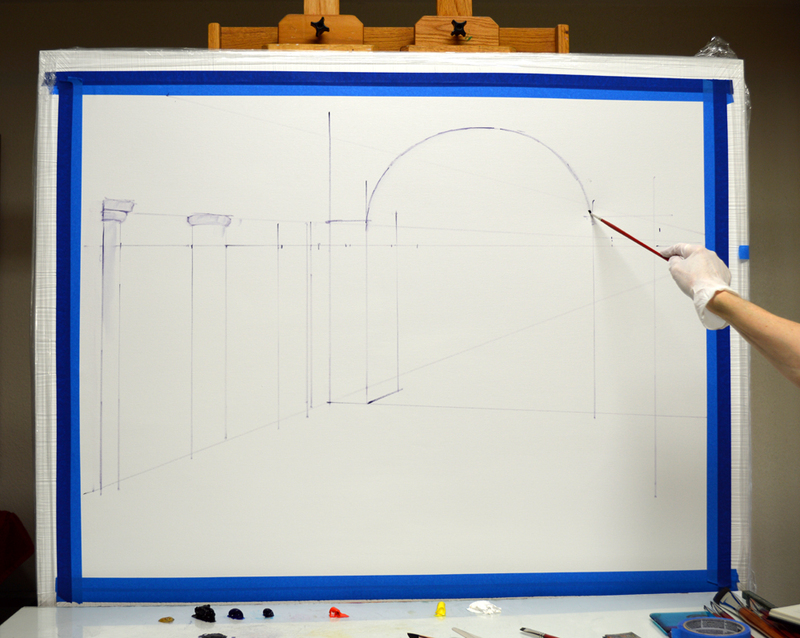 This is the vanishing point for the perspective on the arches. After establishing the horizon line, I begin constructing the building. 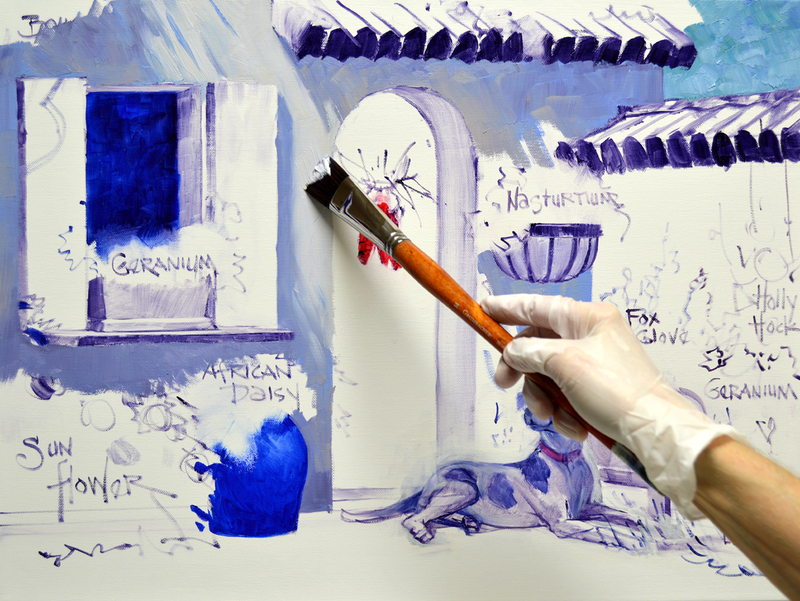 All of the initial drawing on the canvas is done with a brush dipped in a thin oil wash of MUD (Ultramarine Blue + Alizarin Crimson) + Liquin. The red arrow shows the vanishing point, I marked it with tape on the outer edge of the frame. If you will enlarge the picture, just click on the image, you will see the guide lines for the perspective on the arches. Next the planters, steps and the curved walkway leading up to the terrace are “Built”. 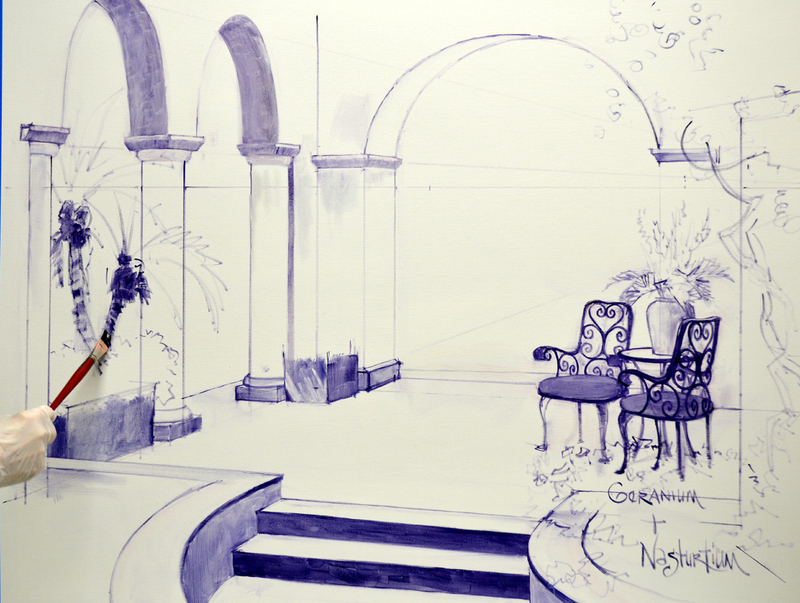 The wrought iron chairs are based on some we took pictures of at the Bellingrath Gardens just south of Mobile, Alabama. Lacy Palm Trees reside in a large container under one of the arches. 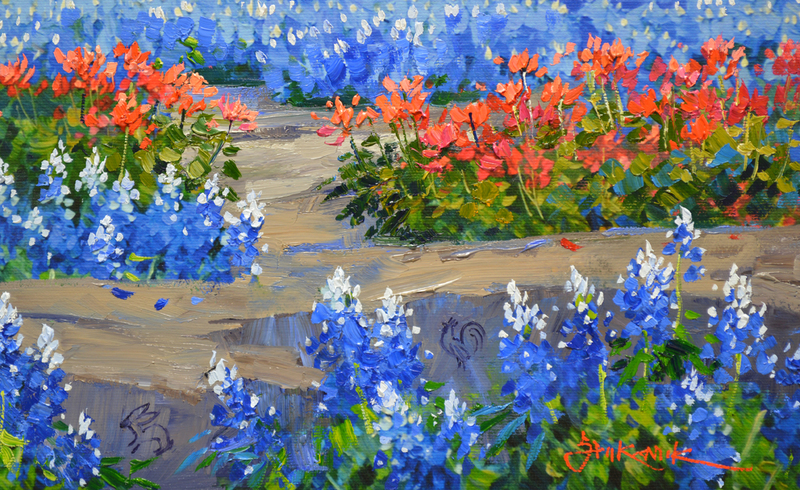 Delphiniums are washed in with mixes of Dioxazine Purple + Liquin and Ultramarine Blue + Liquin, while Magenta + Liquin and Alizarin Crimson + Liquin are used for the Coneflowers in front of them. 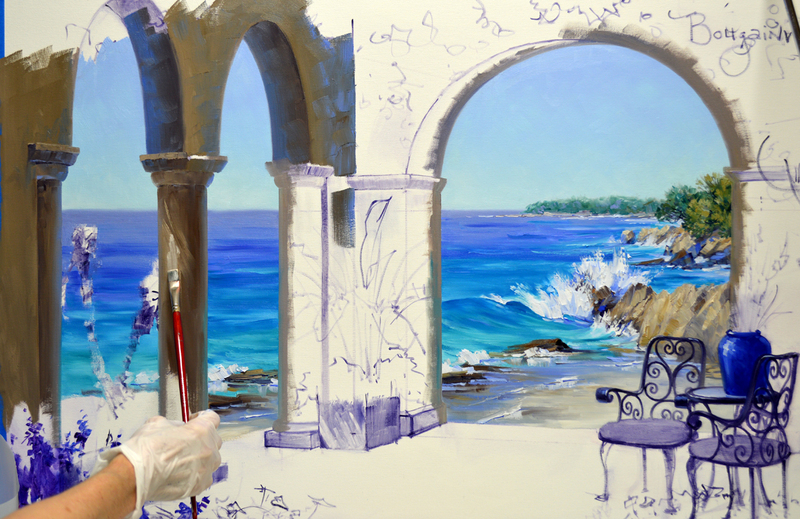 The beach and distant rocks are now drawn in. AND…..our basic plan is all drawn up on the canvas. 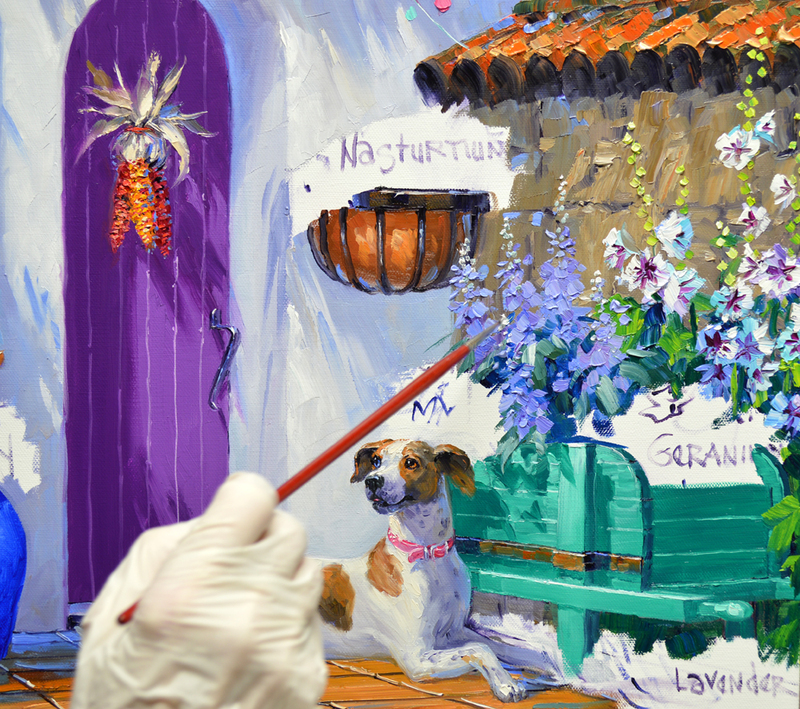 We’ll begin painting in our next session, hope you’ll come watch. I’m going to take videos as I paint the crashing surf in the distance. Please keep in mind, to move through the posts on my blog CLICK on the small titles at the top of the page. The right one for the next post or the title on the left side for the previous session.